Pall-Ex and partner Staples Solutions has won a contract to provide warehousing and distribution for “Graham The Plumbers’ Merchants”, which is part of Saint-Gobain. Goods will be warehoused at Staples’ 500,000 sq ft facility at Rockingham. Pall-Ex has created a new groupage service for the contract. It currently transport more than 100,000 pallets a year for Staples. 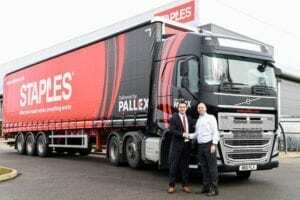 The new contract is the result of providing Saint-Gobain firm Jewson with a service over the last 18 months and is being marked with the launch of Pall-Ex and Staples new joint livery. Pall-Ex managing director Kevin Buchanan said: “Over the last 18 months we have worked closely with Staples to develop a full-service offering, increasing Pall-Ex’s corporate volume by 15 per cent and our network volume by 5.2 per cent. “Our newly created full-load & part load service, the capabilities of our network and the addition of two new Pall-Ex staff, who are based at the Staples site, will ensure we exceed the expectations of Grahams and Saint-Gobain.